It's "a magic-comedy night." 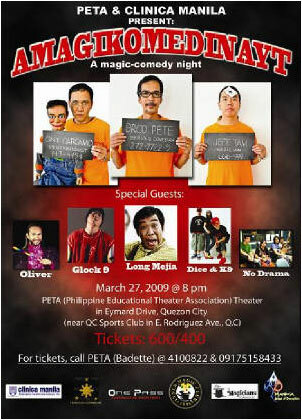 And what a memorable night it's going to be as three of the country's top live comedy performers gather together to give the Pinoy audience a unique stage comedy experience. "AMAGIKOMEDINAYT!" is a magic show, a stand-up comedy show, a musical show, and a ventriloquism show rolled into one. The cast is headed by the irreverent Brod. Pete (a.k.a. Isko Salvador), a veteran sitcom scriptwriter, actor, and the leader of the infamous "Ang Dating Doon," which is now a local classic comic segment. Aside from appearing in TV shows, Brod. Pete has been touring his unusual brand of live comedy around the country and in key cities abroad. Multi-awarded magician and TV comedian Jeffrey Tam will showcase the acts that crowned him the first MAGFI back-to-back (2008 & 2009) Close-Up Magician Grand Champion and 2008 MAGFI Close-Up Magician of the Year. Jeffrey is the only Filipino magician who was featured in 5on1 DVD magazine in Bristol, U.K. He has performed his original "Mahikalye" magic in France, Spain, and the United Kingdom. The country's premier ventriloquist Ony Carcamo will tickle the crowd with his awesome voice-throwing illusion. Since 2000 Ony has been at the forefront of reintroducing ventriloquism—an ancient and rarely-seen theater art form—to the local audience. He has had solo shows in various venues, including the Cultural Center of the Philippines. In December 2008, he won third prize at the International Axtell Vent Video Challenge. Guests include TV actor/comedian Long Mejia, Europe-based International Illusionist Oliver, and rappers Glock 9 and Dice & K9.